It is universally accepted that vital pulp therapy is the treatment of choice for carious or traumatically exposed young permanent teeth (incompletely developed apex). Such vital pulp therapy, often called as apexogenesis, is defined as vital pulp therapy of young permanent teeth that permits continued root formation and apical closure. Endodontic management of young permanent teeth presents several problems such as larger apical diameter versus smaller coronal canal diameter making debridement difficult; lack of an apical stop makes obturation impossible; and thin root canal walls become root prone to fracture. There are three techniques available for the treatment of young permanent teeth with exposed vital pulp: direct pulp capping, complete pulpotomy, and partial pulpotomy (pulp curettage). According to Seltzer and Bender, direct pulp capping is indicated mainly for mechanical small exposure in young permanent teeth and should be discouraged for carious pulp exposures. 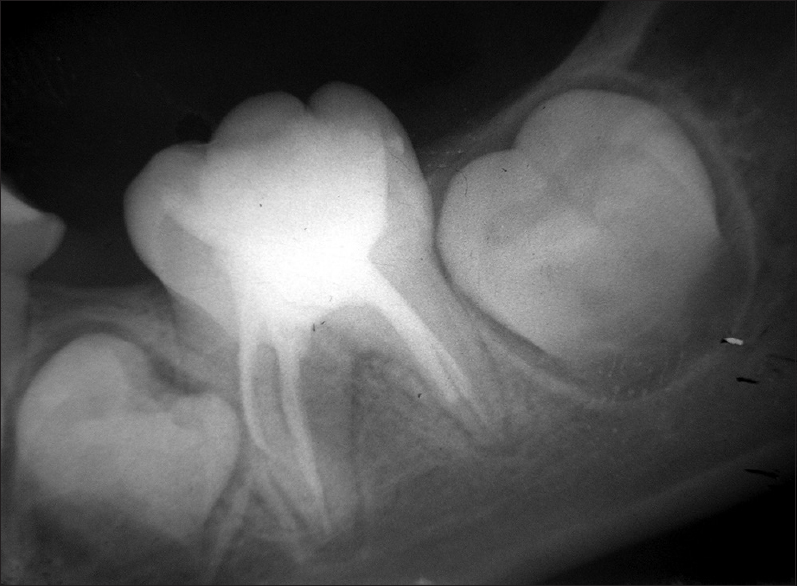 Partial and complete pulpotomy is the technique indicated for traumatically or carious exposed asymptomatic anterior and posterior young permanent teeth pulp until root develops,but the treatment of irreversible involved or symptomatic immature posterior teeth remains a problem in pediatric endodontic.,, Calcium hydroxide has been a popular agent for this type of vital pulp therapy including pulpotomy in the primary and young permanent teeth. It is widely used clinically and is also economical. Calcium hydroxide has a high pH, and its dental use relates chiefly to its ability to stimulate mineralization and also to its antibacterial property. However, specific microorganisms have been proven resistant to calcium hydroxide powder mixed with saline. Alternative medicaments or additional agents have been investigated to facilitate microbial eradication. Studies have shown that chlorhexidine gluconate is particularly effective against Enterococcus faecalis and Candida strains, which have been implicated in endodontic failure and are resistant to treatment with calcium hydroxide., To obtain a wide spectrum of antimicrobial activity, paste consisting of calcium hydroxide mixed with chlorhexidine gluconate has been investigated.,, The present case report demonstrates successful apexogenesis of a symptomatic young permanent tooth using calcium hydroxide-chlorhexidine gluconate complete pulpotomy technique. A 10-year-old boy with a noncontributory medical history reported to the Department Pediatric Dentistry, Sharad Pawar Dental College, Wardha, with the chief complaint of spontaneous and nocturnal pain in lower left posterior region for 10 days. Intraoral examination revealed deep occlusal caries with mandibular left first permanent molar, which does not show any clinical sign of pulpal degeneration such as mobility, pain on percussion and palpation, swelling, and intraoral sinus. The tooth was fairly intact, restorable, and showed respond to thermal (cold test [pulfofofluorange, Pharma Dental Handelsges]) and electric pulp testing (Parkell Farmingdate). 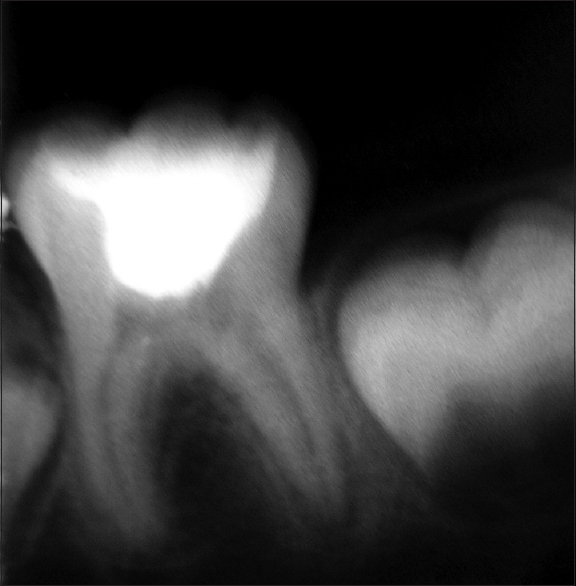 Periapical radiograph of mandibular left first permanent molar showed caries (radiolucent area) approaching the pulp chamber and incompletely formed root apices [Figure 1]. There was no evidence of periapical pathology, interradicular bone resorption, internal resorption, pulp calcification, and pathologic external root resorption suggesting pulpal degeneration. After local anesthesia (Dentocaine 2% Pharma Health Care Product, Mumbai) and rubber dam isolation, a conventional access cavity was made with a high-speed bur using copious water spray. Amputation of the coronal pulp was performed with a sharp, spoon-shaped excavator (Dentsply Maillefer) to the level of root canal orifices. After hemostasis was achieved calcium hydroxide powder (Deepti Dental Products, Raigarh) mixed with chlorhexidine gluconate gel (thick paste) (Hexigel, ICPA Health product Ltd., Ankleshwar) was placed over the amputated pulp surface and the tooth was restored with thick paste of zinc oxide eugenol cement (Dentifiss India Product) to protect it against microleakage. Checkup after 1 week showed tooth to be asymptomatic. Clinical examination was carried out at a monthly interval during this period tooth was asymptomatic. Radiographs were taken at an interval of 3 months. 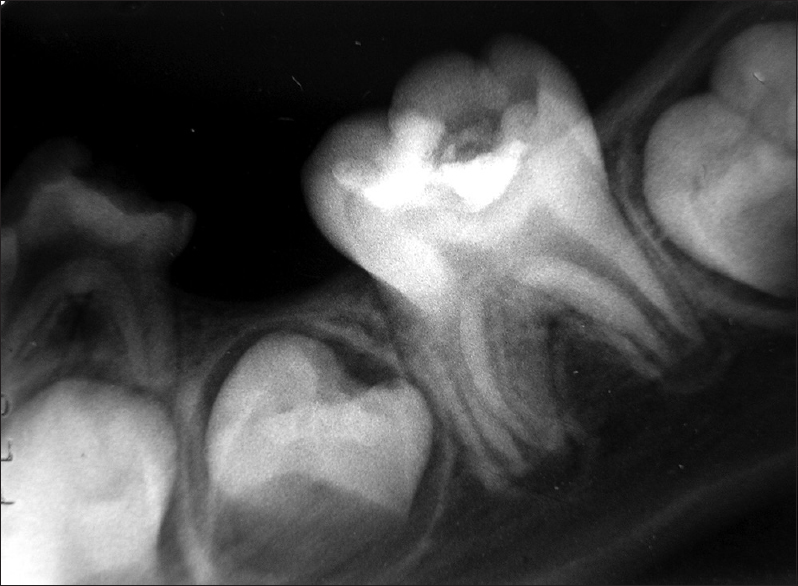 Three-month radiograph showed continued root formation without any evidence of pulpal degeneration such as periapical pathology, interradicular bone resorption, internal resorption, pulp calcification, and pathologic root resorption [Figure 2]. 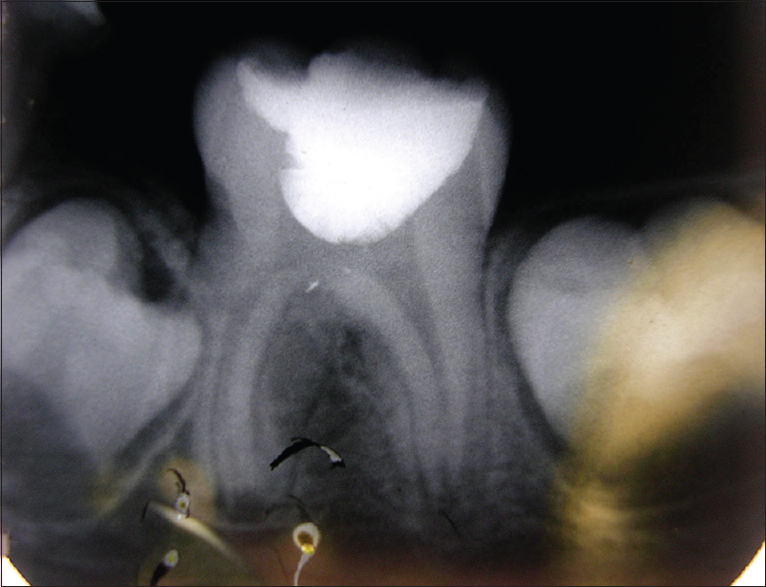 Radiograph after 7 months showed complete root formation with narrowing of the root canals [Figure 3]. In the subsequent visits, cleaning and shaping was carried and obturation was done using gutta-percha [Figure 4]. After a follow-up of 1 month, the tooth was restored with stainless steel crown (3M). Successful endodontic management of irreversibly inflamed young permanent molar is difficult because of thin dentinal walls, wide open apex, and reduced crown root ratio. Thin dentinal walls make the tooth more prone for fracture during obturation, obtaining hermetic seal at apex is almost impossible due to open apex., In addition, reduced crown root ratio makes the tooth a poor abutment. Due to these complications, it is always beneficial to initiate root development in irreversibly inflamed young permanent molar due to caries. It has been documented that remaining viable Hertwig's epithelial root sheet can promote root end closure once inflammation is reduced. Pulpotomy has been the choice of treatment employed in such situations. The goal of pulpotomy is to remove infected coronal portion of pulp, maintaining pulp vitality, generating dentinal bridge formation, and apical closure., Partial pulpotomy and cervical pulpotomy have been the recommended options in such situations. Partial pulpotomy technique is generally recommended in traumatically exposed permanent incisors. This procedure has also been successfully employed in cariously exposed asymptomatic young permanent molar. However, when symptomatic young permanent molar was treated by partial pulpotomy, it resulted in failure., Cervical pulpotomy has been recommended for cariously exposed symptomatic young permanent molar. Treatment of symptomatic young permanent molar has not received much attention in the literature. Apexification has been the only recommended treatment for managing irreversibly inflamed young permanent molar. However, there is no lateral thickening of dentinal walls and continued root development in apexification; therefore, the original disadvantages of tooth fracture and poor abutment still persist. Therefore, in the present case, although the tooth was symptomatic, hemostasis on amputation was achieved within 5 min; therefore, calcium hydroxide cervical pulpotomy was done. This observation was similar to Mitchell and Tarplee, who stated that only 25% of the teeth with pulpitis showed spread of inflammation in root canals. Apexogenesis is preferred over apexification in young permanent molar because apexogenesis leads to continuous root development with thickening of dentinal walls making tooth less prone for fracture. Second, increased crown root ratio makes the tooth withstand masticatory forces. After cervical pulpotomy, pulp has a tendency to undergo extensive calcification because of reduced blood supply. Some authors suggest that, once the apexogenesis is complete, the root canal should be obturation with gutta-percha, as they might undergo extensive calcification making further restorations or endodontic treatment (if required) difficult. Whereas other believes that, as the vital pulp tissue is present in canal, it need not be removed. In the present case, we preferred to obdurate the canal considering the future complications. The tooth was later restored with stainless steel crown. Patient age is another disputable factor which may negatively affect clinical success. Studies have shown that, in older patients, the typically more fibrous dental pulp has a reduced ability to overcome insult. Horsted et al. demonstrated a slightly lower tooth survival rate in the older age. Mass and Zilberman suggested that pulpotomy is limited to children and young adults. The present case encompasses the importance of conservative treatment in symptomatic immature permanent molar demonstrating tremendous reparative potential. The outcome of the cervical pulpotomy was in accordance with the goals given by Webber. Tendency toward extensive calcification is the only disadvantage of this procedure which might be overcome with regular follow-up. In this case report, complete pulpotomy with calcium hydroxide chlorhexidine gluconate paste proved successful in promoting the healing of pulpal tissue. This confirms that even the symptomatic carious exposed young permanent molar can response favorably to complete pulpotomy technique using calcium hydroxide and chlorhexidine gluconate paste. Fong CD, Davis MJ. Partial pulpotomy for immature permanent teeth: It's present and future. Pediatr Dent 2002;24:29-32. Walton RE, Torabinejad M. Management of incompletely formed roots. In: Principles and Practice of Endodontics. 3rd ed. Philadelphia, Pa: W.B. Saunders; 2002. p. 388-404. Bakland LK. Traumatic dental injuries. In: Ingle JI, Bakland LK, editors. Endodontics. 4th ed. Baltimore: Williams and Wilkins; 1994. p. 803. Hasselgren G. Treatment of the exposed dentin pulp complex. In: Qrastavik D, Pitt Ford TR, editors. Essential Endodontology. Malden, MA: Blackwell Science Inc.; 1998. p. 192-210. Seltzer R, Bender IB. The Dental Pulp: Biologic Consideration in Dental Procedures. Philadelphia: J.B. Lippincott; 1976. p. 252-66. Cvek M. A clinical report on partial pulpotomy and capping with calcium hydroxide in permanent incisors with complicated crown fracture. J Endod 1978;4:232-7. Mejàre I, Cvek M. Partial pulpotomy in young permanent teeth with deep carious lesions. Endod Dent Traumatol 1993;9:238-42. Foreman PC, Barnes IE. Review of calcium hydroxide. Int Endod J 1990;23:283-97. Nair R, Sjogren U, Krey G, Kahnberg KE, Sundqvist G. Intraradicular bacteria and fungi in root- filled, asymptomatic human teeth with therapy- resistant periapical lesion: a long-term light and electron- microscope follow up study. J Endod 1990;16:580-8. Gomes BP, Souza SF, Ferraz CC, Teixeira FB, Zaia AA, Valdrighi L, et al. Effectiveness of 2% chlorhexidine gel and calcium hydroxide against Enterococcus faecalis in bovine root dentine in vitro. Int Endod J 2003;36:267-75. Krakow AA, Berk H, Gron P. Therapeutic induction of root formation in the exposed incompletely formed tooth with vital pulp. Oral Surg Oral Med Oral Pathol 1977;43:755-65. Webber RT. Apexogenesis versus apexification. Dent Clin North Am 1984;28:669-97. Fuks AB, Cosack A, Klein H, Eidelman E. Partial pulpotomy as a treatment alternative for exposed pulps in crown-fractured permanent incisors. Endod Dent Traumatol 1987;3:100-2. Camp JH. Pedodontic-endodontic treatment. In: Cohen S, Burns RC, editors. Pathway of the Pulp. 2nd ed. Elsevier: Mosby; 1991. p. 682-719. Fuks AB, Gavra S, Chosack A. Long-term followup of traumatized incisors treated by partial pulpotomy. Pediatr Dent 1993;15:334-6. Mass E, Zilberman U, Fuks AB. Partial pulpotomy: Another treatment option for cariously exposed permanent molars. ASDC J Dent Child 1995;62:342-5. Mass E, Zilberman U. Clinical and radiographic evaluation of partial pulpotomy in carious exposure of permanent molars. Pediatr Dent 1993;15:257-9. Mitchell DF, Tarplee RE. Painful pulpitis; a clinical and microscopic study. Oral Surg Oral Med Oral Pathol 1960;13:1360-70. Heys DR, Cox CF, Heys RJ, Avery JK. Histological considerations of direct pulp capping agents. J Dent Res 1981;60:1371-9. Calişkan MK. Pulpotomy of carious vital teeth with periapical involvement. Int Endod J 1995;28:172-6. Caliskan MK. Success of pulpotomy in the management of hyperplastic pulpitis. Int Endod J 1993;26:142-8. Patterson SS. Pulp calcification due to operative procedures – Pulpotomy. Int Dent J 1967;17:490-505. Haskell EW, Stanley HR, Chellemi J, Stringfellow H. Direct pulp capping treatment: A long-term follow-up. J Am Dent Assoc 1978;97:607-12. Horsted P, Sandergaard B, Thylstrup A, El Attar K, Fejerskov O. A retrospective study of direct pulp capping with calcium hydroxide compounds. Endod Dent Traumatol 1985;1:29-34.